Earth from Space: The Gulf. The Copernicus Sentinel-3A satellite takes us over the Gulf. Also known as the Arabian Gulf and the Persian Gulf, this marginal sea of the Indian Ocean is just under 1000 km long and covers an area of around 250 000 sq km. 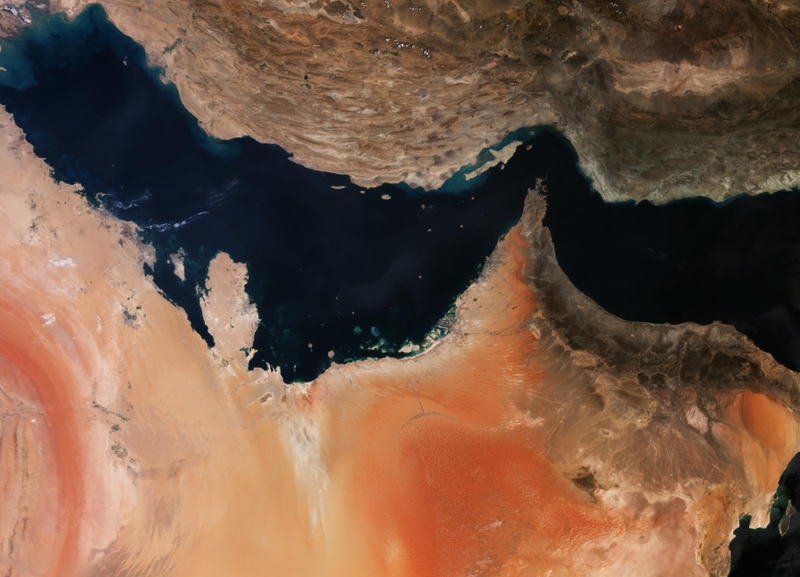 It is bordered by eight nations shown counter-clockwise from the top of the image - Iran, Iraq, Kuwait, Saudi Arabia, Bahrain, Qatar, United Arab Emirates and Oman. Most of these countries are shown in a warm shade of orange in the lower part of the image. The variations in colour in this area represent the different surface types and compositions. Some areas are purely sand, whilst others are a mixture of rocks and sand, or salt mineral deposits. Sand dunes are prevalent in the central area, depicting one of the largest and driest sand deserts in the world - the Rubh al Khali or the Empty Quarter. Meanwhile, Iran is shown in brown in the upper part of the image. The country's rugged terrain is clearly visible, with mountainous rims spreading out across the southern part, interspersed with towns, cities and other urban settlements. The fifth-most-populous city of Iran, Shiraz, can be seen in the top left of the image. Once home to vineyards, where wine of the same name was produced, the city hosts some of the country's most spectacular gardens and an array of impressive mosques. It is known for its literary tradition and the tombs of the poets Saadi and Hafez can both be found here. The Gulf of Oman, flowing into the Arabian Sea can be seen on the far right of the image. In spring 2018, underwater robots confirmed a 'dead zone' in this area, thought to be bigger than Scotland, where there is little to no oxygen. This may have been caused by the use of chemical fertilisers and wastewater. The Sentinel-3 mission gathers data on our oceans, land and ice, as part of Europe's Copernicus programme. It can measure sea-surface temperature and sea-surface height, as well as providing important data to monitor the health of our marine ecosystems. This image, which was captured on 30 September 2018, is also featured on the Earth from Space video programme.